A real treat for the textiles fans amongst you this week, as we meet artist Kim Winter to chat about upcycling, dyeing, felting and lots more besides! I am a textile artist mainly working with wet felting, indigo shibori dyeing, and ecoprinting. I buy scarves and garments from charity shops, jumble sales and eBay, and overdye them with indigo or ecoprint on them, to create one-off upcycled pieces. 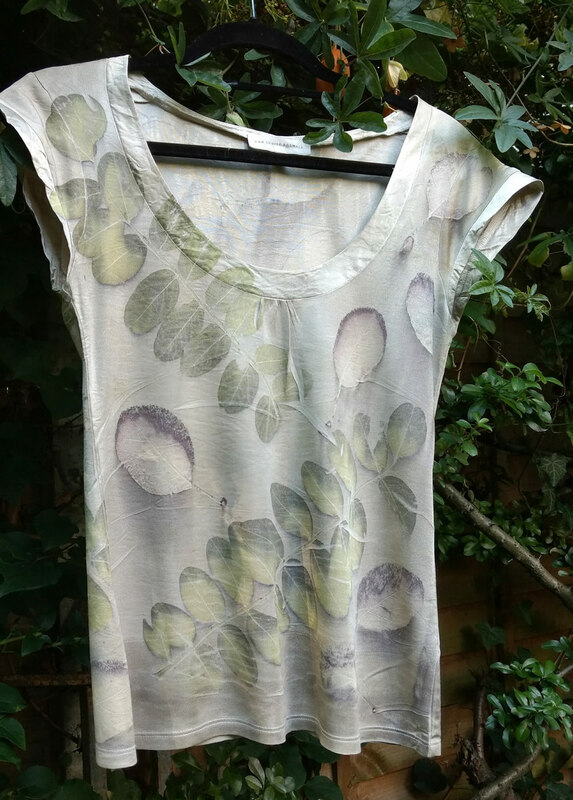 I love rummaging in charity shops or jumble sales looking for garments to upcycle. It's more interesting for me, as each piece is different - I'm not buying a job lot of white scarves and trying to make them all different. And my customers know they're getting something unique, the charity shop benefits, and so does the environment if I can save more textiles from going to landfill. So it's win-win all round! To make felt, I layer sheep's wool that has been cleaned and combed, add water and soap, and rub and roll it so that the fibres mesh together, and shrink to form a fabric (it's a more controlled version of putting a sweater into a washing machine on a hot wash!). I particularly enjoy making 3D sculptural shapes that are robust and durable yet soft and immensely tactile. There is no typical day – it depends on the time of year, the weather and how much other work I have (I also build websites to help pay the bills). Felting can be done at any time, but I do most of my indigo dyeing in summer, because I need to work outside so that the fabric can hang somewhere while it oxidises. For some reason, my partner isn’t keen on having a kitchen full of dripping indigo! I find that late summer and autumn are best for ecoprinting – although there are some leaves that print well all year round, others seem to have higher levels of pigment at this time, so I try to make the most of them. If I’m ecoprinting, I will bundle something up in the morning and leave it steaming for a few hours while I work on websites. If I’m dyeing with indigo I do an initial dip first thing and then go back and dip again every few hours to build up a deeper colour. I work from home. I do my felting on the dining room table and also roll up my ecoprinting bundles there before steaming them in the kitchen. Indigo dyeing is restricted to the back garden, although I have been known to do it indoors and clean up before my partner gets home from work (don’t tell him!). When I’m not working I enjoy visiting charity shops (though I guess that counts as work! ), going to exhibitions, reading and cooking. I also do voluntary work for two organisations - I help run the communications group for the Friends of Windmill Gardens, which runs open days and community activities at inner London’s only working windmill; and I’m a volunteer director for Makerhood, a Lambeth-based social enterprise that connects local makers, businesses and the community. Where do I start?! Some challenges are common to all micro-enterprises: needing time and skills to be able to do everything from marketing, accounts, business planning, website updates and so on. Makers are makers because they like making – if they liked selling they’d be in sales! So it’s always a challenge to find ways of doing things that are necessary but that you don’t like doing. The other thing is the huge resurgence of interest in making and crafts. This can be good for business if you run workshops, but it can lead to a situation where people who make things as a hobby start selling their work at prices that just cover the cost of their materials. This can make it very difficult for those of us trying to do it for a living! Last year I was commissioned to make some ecoprinted fabric for a wedding dress. It was extremely nerve wracking, but the final dress, made by the bride’s mother, was absolutely stunning and it gave me a real kick! So it would be good to work on more commissions like this. I get regular requests for workshops, but I don’t have the facilities for dyeing or steaming with a group of people, so I need to find a space that can work with that. I’d also like to expand the opportunities for my felt work. Compared with the upcycling side, making felt is rather laborious and time consuming, so the price is relatively high. At the moment my felt is mainly limited to exhibitions with groups like South London Women Artists and the International Feltmakers Association. I need to research other outlets and opportunities. You are not alone! As a designer maker you can feel very isolated, working away in your studio or back bedroom, but lots of others are doing the same. One of the great things about Makerhood is that I was able to meet other makers, share ideas and information and do events and open studios together. So it’s worth talking to fellow makers and perhaps teaming up at markets and other events to share the costs and risks. And don’t give up. My very first attempt at selling was with another feltmaker at Spitalfields Market – we didn’t sell a single thing all day! But looking back, it was the wrong sort of market for our work. One of the crucial things is to work out who your customers are – and then how to reach them. · Diverse in Brixton is a gift shop run by Anita Thorpe, who has done a lot to encourage local designer makers, especially with her Makerhood showcases. Like many other locals, my first experience of supplying a retailer was with Anita, and her patient feedback is incredibly useful. · Morley Gallery is attached to Morley College, where I have done several textile courses, and there’s always something interesting to see, including work produced by college students. · Joss Graham’s shop/gallery is a treasure trove for fans of textiles from Asia and Africa, though he also stocks paintings, sculpture and jewellery. · Adire African Textiles, as the name implies, stocks a wonderful selection of African vintage textiles. Lots of indigo resist-dyed adire as well as the narrow-strip kente cloth and fabulous asafo flags from Ghana. · Shepherds is a specialist supplier of paper and bookbinding goods – one of those places you walk into and instantly want to buy everything you see! I particularly love their Japanese decorated papers and marbled papers. I did realise it was about more than cards but I never used to have any low-price items, so I found it difficult to apply to my business. However, now I have bookmarks and I usually have a “bargain box” at shows I do, which has proved very popular! It’s hugely important to me and all small businesses selling handmade items. Often people may feel embarrassed about not being able to afford a more expensive piece, but buying something small like a card (or in my case a bookmark) shows that you appreciate what the maker is doing and makes her feel it is worthwhile. And all those small purchases add up! My partner says that the biggest customers for makers are other makers. There may be something in that, because of course we understand the love and care that goes into making when we do it ourselves. The challenge is to get other people who aren’t makers to understand that. I met Sarah Hamilton, who started the campaign, at an open studio event and found her passionately persuasive about Just a Card. I have a Facebook page but I tend to use Twitter more because I run accounts on behalf of Makerhood and Friends of Windmill Gardens as well, and because it’s easy to retweet. However, I’ve just discovered how to regram on Instagram, so I suspect I will use this more in future! As designer makers we all have a part to play in highlighting why handmade work is unique and worth supporting, by promoting the campaign through social media and talking to customers at events. I already have the button on my blog, but of course after this post is published I will have even more incentive to spread the word through newsletters and social media! Hopefully together we can get the message across and increase sales!